Are you a Downton Abbey fan? I only became one the season before last but I'm firmly hooked. I had to go on Downton Abbey binges to catch up, but I didn't mind at all. They're addictive, aren't they? But why? My theory is that as we follow the main characters from week to week, we get to know them. We know their likes and dislikes, their habits, their peccadilos, and their strengths. They become friends. Add to that those charming British/Irish/Scotch accents, those wonderful costumes and antique autos, and that majestic house, and what's not to like? Isn't that also how a book series works? Readers get to know the main characters, their strengths and weaknesses, their manner of speaking, their senses of humor, and soon they become like family, too. As it turns out, it works that way for the series' creators, too. I always have my eye out for people who remind me of Abby Knight, Marco Salvare (haven't found one in normal life but I did see a Greek tour guide who was pretty close) cousin Jillian (I've seen a number of Jillians) Taras, etc. There's a waitress at a Chicago Italian restaurant called Volare who is exactly how I picture Lottie Domkowski. I've been writing The Flower Shop Mysteries for over ten years now, so the characters are very close to my heart. And now in my new book, A ROOT AWAKENING, out February 3, you'll get to meet a new character whom I absolutely love already. I hope you'll feel the same. In the meantime, stay healthy, be happy, and enjoy the new season of Downton Abbey with me. And I have to ask, who is your favorite character? Kate---I also had to binge watch 3 seasons of Downtown in the summer/Christmas of 2013 to catch up. So many friends were talking about it that I decided I wanted to see what it was all about. Now I'm addicted but I always watch it On Demand because I have other shows on Sunday nights. I have two favorite characters, Lady Mary and Anna, for many of the same reasons. They are very strong women who endure much but still make it through. I think Lady Mary recognizes herself in Anna (who else could have helped carry the body thru the house without being hysterical?) and vice versa. They will prevail and be happy eventually. I also agree about characters in book series. They are family. Don't know if you read the Kate Shugak series by Dana Stabenow (if you don't, you should) but when one of the main characters died I cried and so did lots of her other readers because she says she's always yelled at for killing him off. Sorry, I know I am the only one in the world who is not a fan of Downton Abbey. I watched two episodes years ago and fell in love with the house and contents and some of the clothing. The rest never appealed to me. But, in books, I am addicted to certain series and the characters absolutely are people I wish I knew. I believe human nature makes us attracted to certain humans we meet and written characters must be the same. I adore Downton Abbey! My sister-in-law and niece gave me a DA t-shirt for Christmas, but it was too cold to wear it last night! The Season 5 premeire was awesome! I don't necessarily have a favorite character, but I really, really can't stand Thomas Barrow! I call him The Weasel (capital T, capital W)! Hehehe! The formula for Downton Abbey is the same as for soap opera: one plot twist after another. Since that formula has worked for decades, it should be no different for Downton, especially since it has the added, delicious details of setting, costumes, and accents. My favorite character is Lady Edith, with Mrs. Hughes a close second. Mrs. Hughes is the "temperature" of the show; she reacts to what is going on upstairs and down, and seamlessly pulls it all together, quietly, behind the scene. And Lady Edith has had to endure nearly all of her travails alone stiff upper lip, while her scenery-chewing sister gets all the attention and sympathy. Edith is a much more complex character, and the actress has to really act to show what's going on below the surface, unlike Mary, who blabs it all. Yes, I do root for the underdog! I'm so happy Downton Abbey is back on. I love it and all the people but Thomas. Edith should get someone to confide in. Mary does blab but then so do I. Love Anna and Bates and the rest of the people.I like the table scenes because I really like china and crystal and a pretty table setting. Have loads of pictures of table settings at all our family dinners. Not quite as fancy though and no butlers for us. 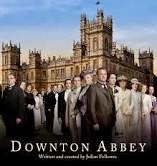 I wish Downton Abbey was all all year, but then it might not be as special to us.. I too am a fan - love all the ceremony and how the characters are trapped by their circumstance. Congrats on the new book! Can't wait. February needs more flower shops. Cordella, I agree with you on all counts. I toyed with the idea of one of the characters in my series dying and couldn't bear the thought of dealing with the grief -- mine as well as my readers. That's very true, Annette. There are shows on TV that are hits but I don't click with the characters so I don't watch them. I guess that's why we have so many choices in shows as well as books. Thomas is my least favorite, too. I wonder if he gets hate mail. Poor guy. He's a good actor to engender that kind of emotion from viewers. It's really weird to hear a character change accents. I was a big fan of HOUSE, but when I heard Hugh speak in his normal British voice, it sounded fake! I agree with your assessment. The show about the manners of Downton Abbey last night was fascinating. It was a look at the actor behind the role, always kind of a shock. Did you see it? I'm hoping the show brings back a love of crystal, china and silver. Young people don't buy them anymore, it seems. A loss. The world always needs more flower shops, MJ. LOL. Thanks for the congrats. Maggie Smith as the Dowager Duchess is my favorite character. Anna is a favorite as well. I really hate Thomas, too. Poor Edith has it hard but I have hope she will triumph in the end. I did. Wasn't it interesting? I really appreciate their attention to detail. Didn't it break your heart to see Edith holding the little girl? Maggie Smith cracks me up. Am i wrong or did she have a little lift done? It was almost as fascinating as the show itself. But I used to write historical romance, so that kind of detail always fascinates me. I love all the characters and I am so excited that it is finally back! Thomas is my least favorite character, but every good soap opera needs a Thomas. I can't wait for your new book! I really enjoy your mysteries and can't wait to meet your new character. Thanks, Mary. I think you'll love her and will laugh at her, too.